I finished off March with 304.7 miles, that’s a record for me. I have been sticking to the 30% of those miles being on my Zero Runner. The dedication and time it takes to keep running this many miles with a full time job and working around family schedules is very humbling. To be honest, it’s been hard to get an idea where I am at training wise. This past month I have been training through being sick and there have been some colder and windy days causing me to work harder at slower paces. I figure in the end it will make me stronger. My longest run so far is 20 miles. I ran repeatedly up and down a 2 mile hill in Shawano. The hill incline starts off at about 3% and gets as steep as 8% near the end. 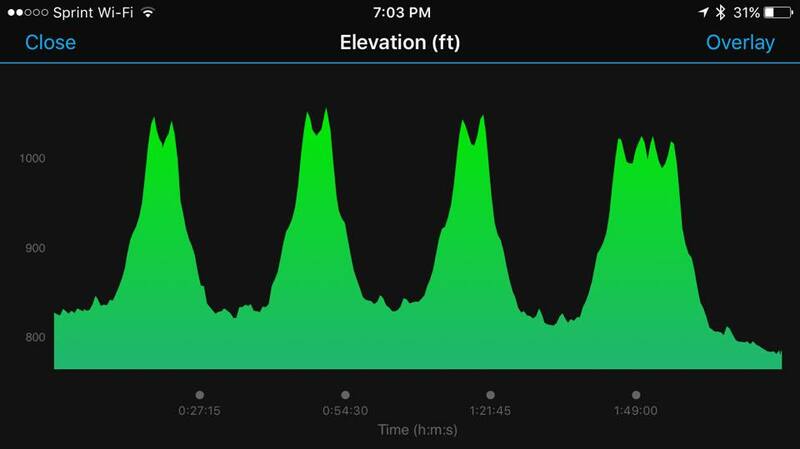 My Garmin left a pretty good visual of the elevation climb. Another day I missed my midweek session of intervals since I was feeling under the weather. To make up for it I did a session of fatigue intervals. I did 4×1 mile repeats at 10K pace followed by a 10 mile run to get used to running on tired legs. From start to finish I ran a total of 18 miles with warm up and recovery between the repeats from start to finish. My pace average for the whole run was 6:18 per mile. In the end, I didn’t miss my long run and I didn’t miss my intervals doing by doing a combination of the both of them. Besides all the running, I have been foam rolling before I go to bed each night. After my harder runs I use an ice roller on my legs and then I usually soak in Epsom salts for inflammation. The primary areas I tend to have trouble with are trigger points in my hip that I have to massage out. Also, when my calf muscle starts to tighten up I feel my peroneal tendon get tight. Usually it hurts a bit on the outside of the foot when this happens. I’ve found if I take my electric massager with the attachment for trigger points and run it along the outside of the calf where the calf muscle and shin bone meet, it loosens right back up again. That’s all I have to say for now, I hope everyone’s training is going good. 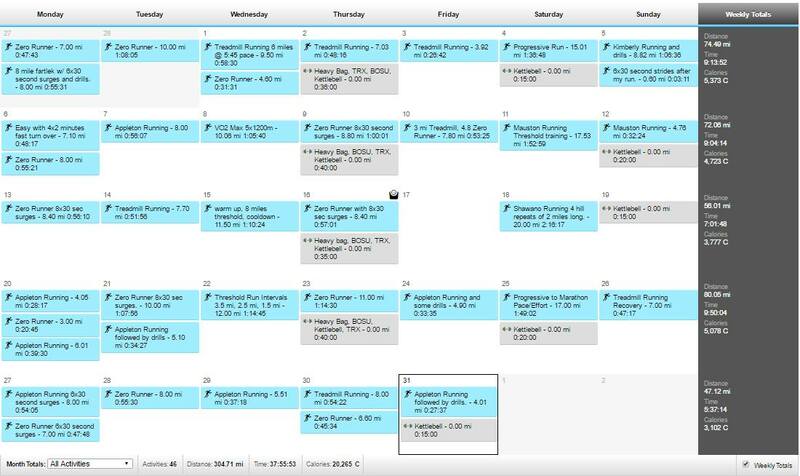 Here is my March training so that you can see my progress thus far: T.J.’s March training.